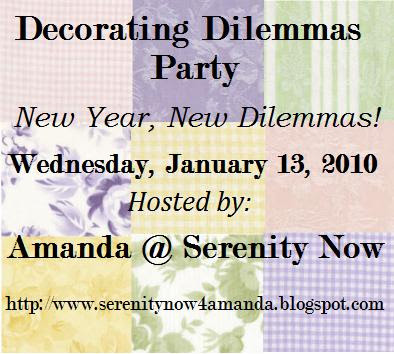 Serenity Now: Decorating Dilemmas Party...Round 5! Welcome to the Decorating Dilemmas Party! PLEASE READ THE RULES BEFORE LINKING UP!! It's kind of unnerving to admit that you need help AND post photos of your problem online for the whole world (or 20 readers) to see. I hope you're here because you need some fresh ideas or can offer some feedback. Don't have a Dilemma? Then I bet you have a SOLUTION or two that you can share for those of us who need some help. Please feel free to link those up as well. This way, if McLinky hates me, dumps me, and ignores me, we can still all visit each other through the comments! Also, I like comments. And I need help too! Please try to visit at least one other link on the list. This party isn't about promoting your blog by sticking your link up and then waiting for comments and visits to come rolling in. It's about offering genuine, thoughtful feedback to others, and receiving the same in turn. If you can't get around to visiting right away, that's okay (really! ), but please make an effort to stop by a blog or two by the end of the week. I'm not asking you to write an essay-comment for the blogs you visit, but please leave a helpful thought or two. You'd be surprised at how easy it is to see someone else's Dilemma and come up with all sorts of ideas. Have fun, everyone! Link Up Here, and please be sure to scroll down to help me with my Dilemma! I need help with updating Accessories in our Family room! T and I bought our first home (our current home) when we were fresh out of college. At 22, I didn't really have a sense of what decorating style I most identified with. As a result, I think I leaned toward a more country look because that's what I grew up with. I don't have anything against the country style at all...I just don't think it really reflects who I am. And the trouble is...now my Family room doesn't really reflect me either. Should I spray paint the frames on the "Banjo wall" white (or another color)? All the other frames in the room are white. (The photos are all black and whites of my dad and his little sis as kids, and their parents as kids). Should I keep a wreath above the banjo (the banjo belonged to my dad, sentimental piece), but just do something updated...maybe with a monogram? There's not much I can do about the couch and blue chair. There's nothing wrong with them...I just want a new look! I could slipcover them, but my sewing skills aren't really on par with a project like that, and I just don't have the extra cash to spend on some from the store. Plus, I think slipcovers look great in photos, but the second you sit on one, the whole look is ruined. So...should I make covers for these pillows and the 4 on the couch?? Maybe out of a neutral painter's dropcloth?? Should I spray paint them? What color? T and I had a *nice* discussion about these lamps last night. I can quote him as saying, "You are not painting those lamps." T is a pretty traditional guy. He's fine with me spray painting picture frames, platters, and little stuff until a cloud of mess forms over our backyard. But I think spray painting large pieces like the lamps makes him a little uncomfortable. Any words of wisdom here?? It should be noted that he rarely spends time in this room other than to iron his shirts in the morning. Please help me out, friends! Thanks for putting up with this extra long post. I hope you all get some great feedback and ideas this week! In answer to some of your questions...for the lamps, how about spray-painting them with Oil Rubbed Bronze spraypaint? Changing the shades to drum shades would also get you a new and stylish look for not too much $$. I love monograms in wreaths...not sure about the pillows. Maybe someone else will have some great ideas for you on that one. And the frames - my first thought is to paint them black. Why don't you also play around a little bit with placement -- just for a change? Love the banjo! Hi Amanda! Thanks for hosting! Okay, the first thing that jumped out at me is the oak. Then I saw that you're looking for new tables, etc, but you could just paint them, at least for now. I say yes to the white frames. I'm not so sure about the wreath. I think I would take it down and use the monogram idea or other wall-words (something to do with Family, or whatever you like). I know what you mean about slipcovers. They do have the kind now that stretch to fit...seems like they wouldn't get as frumpy. You might be able to get one cheap on ebay. But here's an idea, maybe: what if you got a big drop cloth and just draped it over the back of the couch (staple gun it to the frame at the back), the seat, and down to the floor, leaving the arms bare, and tucking the dropcloth down into behind the cushions. They say a piece of pvc pipe down in there holds it in. Am I making any sense? Email me if you don't get it. It would just tone down the plaid, and hey, if you don't like it, it was only about $20 and you still have a usable dropcloth! If you were going with a kind of white theme here as far as accessories (frames, etc) then I might suggest painting the lamps white, but wiping the paint off a little on the design to distress it some. As the room looks currently, the red pillow is kind of out of place. I probably would cover them all...not sure with what, but maybe look on etsy or something to get ideas for a more updated and less country look. I do like the striped one, though. Is it okay if I suggest something you didn't ask? Well, I'm gonna ;) I think if you're getting rid of the country you might want to think about changing the drapes. I'm thinking a solid color (maybe the dropcloths!) and down to the floor. I think the white frames are a good idea - white paint always seems to be a simple way to update something. I agree with taking the wreath down and doing a monogram or wall-words, like Holly suggested. I love wall-words, and it really makes the space feel personalized. I am thinking black frames also. I will be back in the am after coffee also. Have a great evening. Amanda, I would opt to replace the wreath with a monogram or maybe a vinyl word saying..its late here, I will be back in the morning post coffee also and will be linking my own issues to your party, lol.. I only have a second...I will be back later to visit. The first thing that I thought of when I saw the wall above your sofa is that if you redo the arrangement of the pieces, the banjo would look great hanging vertically instead of horizontally. I would get rid of the wreath and put more framed pictures there or use a larger framed piece as an anchor. Ok, I don't have much room to comment, because I'm in the SAME dilemma - changing my look from prim country to a more fresh clean look....and on a budget!! I'll post my family room next time! For the pieces over the sofa - I would just mix it up a little, hang the banjo versicle with a grouping of pictures next to it - or maybe 2 or 3 of those ledge shelves and lean and layer your pictures on them! For the tables, I know they're oak, but if they're not worth anything, and you don't want them - try painting them - if your hubby really protests to that - then I'd been on the search at GW for some table to paint that he's not attached to. For the lamps - what if you got some wide ribbon and tied a bow around each shade? Fun Party! !....I think my solution is going to be chalkboard paint! Want to know something funny? When I had it down taking a picture, hubby had a FIT when I told him I wanted to change that ugly thing! LOL---see I told you! Now for your room, Is it possible to put the banjo vertically? If so, I think it would look great and maybe you could find a display case to put it in (If it's not to expensive...I have no idea what they might cost). Then for the pictures, maybe you could get them blown up a little and then spray paint some larger dollar store frames white. You could then take down the wreath and arrange the pictures around the banjo. As for the lamps, I like them..maybe you could just find a fun trim to ad around the edges of the shades to change it up a little if you are tired of them. I will visit with you and visit everyone else tonite after I get home from work. But I just quick wanted to post my link. One quick tip above your couch: I would keep the banjo since it's sentimental and it's a neat decorating feature. I would maybe find a new home for the wreath. The photos are very neat, but I think I would frame two or three together to make a bigger statement with them. Or, you could enlarge them so that they make a bigger impact in that space. Just a thought! The lamps, I go for what commenter #1 said and change them to an oil rubbed bronze. Later!!! I'm partial to black picture frames - black helps to ground a room, and I think you could use a few little black touches in the armoire area. I love the banjo - but I think if it can be hung vertically, it would look more banjo-y (know what I mean?). I think I'd repurpose the wreath somewhere else in the house. Joy just did a really cool tutorial on word canvases http://www.joyshope.com/2010/01/one-word-canvas-tutorial.html I for sure am making one for my house, maybe just a monogram though. I've seen huge canvases/frames at GW - could totally bring the cost of the project down. ok, I had so much fun going thru everyone's posts.....I made a new one, since I need help changing my family room from country to more clean! Hey Amanda! I love that you have the heritage pics in your living room & I do think the frames would be nice in a different color; if not white, maybe black or a smokey or charcoal gray & I do really love the idea of replacing the wreath w/ a monogram or maybe a vinyl wall print w/ a scripture or phrase on it. I love the detail on your lamps but do think they'd look nice in a darker bronzy color, bordering brown to warm them up more & look more cohesive w/ the decor in your living room. Maybe instead of spray painting them you could rub on some bronze to give it a more aged look too. And the slipcover thing I'm at a loss for b/c I sort of have the same problem. :-/ Good luck! Let me know how it goes! I couldn't take pics of the dilemma I wanted to share b/c we still have moving boxes covering it but I'm hoping to get pics of the bathroom (semi) re-do that I posted in one of your other parties. My family is having a little gathering for my b-day tonight so I hope to post it in time b/f Mr. Linky closes. Have a fun party! Hey Manders!!!! Me, being the self appointed Queen of PAINT it... says go for it! Mr. T will probably not even notice LOL. Thanks for hosting. I've read the past parties, but wasn't ready to enter yet. I'm excited to be included this time! For your room, I think it would be easy to change things up! I actually love the plaid couch so I don't think any slipcovers are needed. If you don't like the country vibe you have going on, I think you should lose the wreath and the curtains. Replacing or changing the curtains, pillows, and frames with white would instantly freshen the space up. I don't think that the coffee table you have right now is so bad and would look great if you went with white for it as well. For the banjo, is it possible to hang it vertically? I think it would look nice sandwiched between the frames or on the wall by the tv. I just found your blog through Tidy Mom. I feel the need to jump in. I would change the frames to black and you might want to look for larger frames. Your scale is a bit off above the couch. The current frames are just too small along with the frames by the entertainment center. The Dollar Store or Dollar Tree--whatever is in your town--has decent black frames next to nothing. It will help make those family pictures POP! I would hang the banjo vertically over on the entertainment center wall. Move the other family pictures to the space above the couch, get a large mirror and put the family pictures around the mirror. My hubby has learned after many years that the decorating is my deal. I used to consult and ask his opinion but what I really wanted was for him to agree with me. I now just do the project and he says, "that looks great!" :) You have great taste and I'm sure he'll trust it. Good luck! 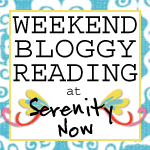 I look forward to reading your more of your blog. I love this party! I don't have anything to post, but I love reading through everyone's post and especially suggestions! 1. Some of the colors that you're already using in that room could lend themselves pretty easily to a beach-type feel, if you wanted to go that way. If you changed the wreath and drapes, painted the frames white, painted the hamps and maybe updated the shades, maybe painted and distressed the end tables/coffee table too, I think the banjo would still fit right in with the colors. 2. I love that you're using family photos, and I'm a huge fan of black and white photos. I think though, like a few others have suggested, that you might need to add a bit of weight to that wall. I think the idea of using shelves and propping the frames there is a great option. The other thing you could do is make some large panels "around" the frames. You could paint a separate color directly on the wall, or just take foam core or thin plywood and paint it or cover it with fabric, then put the frames on top of that. 3. Lastly - I think its okay to include frames with different finishes in a room, as long as it looks like you did it intentionally. If you mixed up the frames on that wall so that there were wood ones and white ones (and maybe even black too), and even added some thrift store frames in different sizes, it could work really well. I saw a picture of this done well recently...wish I could find it again! Hi Amanda! Lots of party-ers today! I am into more browns and blacks, but it seems like you have a lighter, more brights and whites feel going on. So I would say yes to painting the frames white, I think it would really look nice with the white moulding. Also, I think you should change the matts on pictures if you do the frames white. I agree with another commenter who said to maybe change the wreath out for some wall lettering. Yes to painting the lamp! 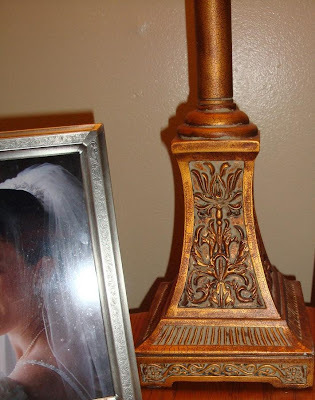 I love Oil rubbed bronze, but it may not go with the rest of your decor. For your tables...if you're brave...you could paint them an heirloom white, then mod podge the tops with fabric that matches your decor! And I always think that changing up pillows is a great way to give couches a new look! Great party! What a stellar idea! I LOVE the banjo and think it's awesome on your wall. I kind of think spray painting the frames white and adding new mats would look sharp. I also like the idea of switching out the wreath and maybe adding some more white elements to the area to freshen the space. But do keep a little of the country element! I like that your space has so much individuality! Here's my issue: http://megsewell.blogspot.com/2010/01/april-showers.html My bathroom is a hot mess and I'd love a big impact makeover for a steal of the deal. The wood hardware is already in the trash bin! Hey Amanda, Thanks for your suggestions. We also have a country couch that looks be the exact same shape as yours. We bought our slipcover at Target. It is a two piece one so the cushions have their own cover. It helps it stay in place really well and TOTALLY changed the look of our room! I honestly only have to readjust it every week or two. It's not as much hassle as I thought. Since you mentioned you don't have the money for one, you could keep your eye open for one on Craigslist, ebay or GW. Another slipcover tip that my MIL uses is velco on the inside. Hers is a lot more expensive than mine and has an individual zippered cover for each cushion on the seat and on the back of the couch... it doesn't even look like a slipcover! I do think the blue chair would look less country if it wasn't paired with the plaid couch and if it had some modern pillows. It looks a lot like an IKEA chair my MIL has. I really like the idea of painting the frames and the lamps and the tables. The color I guess depends on the overall feel you are headed towards with the room. You could always paint the white frames too. If you are going to pick an accent color with some punch (like red or peacock blue), you could paint the lamps that color. I also like the oil rubbed bronze idea. A few of my observations: Your sofas are just fine, I like the blue and white. I would stick to cream pillows, a few subtle botanical patterns, and maybe a really bold silk navy blue pillow too. Add a cream chenille throw and they're perfect. Yes, I'd take the wreath down, remove the busy flowers and leave it just branches, then hang it next to your armoire and take down the small pictures above the rocker. Then I'd cluster all your picture frames in one single spot. BH&G has an awesome link to hanging pictures, I'll send it to you. I'd paint the frames white too. I'd also prime and paint your coffee table white. Long term, I'd add cottage paneled wainscotting to your family room - that would look FAB behind your sofas. And yes, I'd paint the lamps, probably bronze, but white would look good too. I'd rub off paint on the detail and let that show through. And I'd get slightly larger modern drum lampshades. Just my two cents. 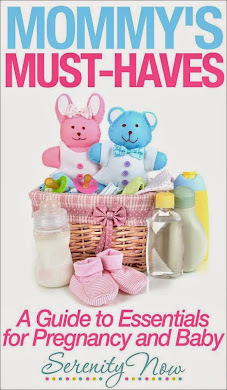 Most important - it's a lovely space filled with warmth and family images. 1) Yes, paint 'em white! It will help tie the room together and really make the photos the focus. 2) If you're looking to move away from country, I'd move the wreath as well... The monogram idea is fun. Maybe even turn the banjo vertically and add the letters beside it. 3) I feel your couch issue, as we're currently making do with ours. I'd definitely re-cover the cushions, especially the ones that match the couch. Adding a throw on one side of the couch would also help neutralize it. 4) Tough call! Once you've painted them you can't go back. But I would... either white (more country chic) or black, depending (more contemporary). i was gonna say oil-rubbed bronze on the lamps too--or oil bronzed rub, or rubbed bronze oil...i'm tired. that banjo is so neat; love having such a personal touch. ok, so just saw your comment about the lovely bones--yes--lots of creepy parts; i couldn't wait to find out what happened, and i can't wait to see the movie. my good friend HATED the ending to the book (have you finished?) and we're kind of hoping the movie is different! I think your room is gorgeous. With the sofas- since you cant change them, maybe some cushion covers and a throw? I'd say definitely paint the frames. I think if you want more color, you could bring in more art work (maybe framing wallpaper or wrapping paper for a quick fix). I think the frames are really small compared to the large sofa, banjo, and wall. I think they would look great painted white and mixed with other pictures or art. I don't think the wreath really fits, so if it fits somewhere else I would move it or take it down for later use. I think this wall would make a great picture wall with the banjo at the center. I like the idea of rotating the banjo. Then I would use it as a centerpiece with pictures all around. You could definitely cover the pillows or you could buy a large blanket and drape it over the back of the couch for a different color. I say definitely paint the lamps if you don't want the color. I don't think it would be that hard to spray them to look like the original color if you changed your mind. I don't really have a color in mind, perhaps blue, red, or white but if you changed the accent colors of the room it could go any way. Hope that helped. You really have a lot you can do! I hope you show us some after pictures if you end up changing anything! I'll send you another note in a few, but GREAT idea for the party!!! This is my first time here. Will you be doing another Decorating dilemma post? I just recently posted a decorating dilemma on my blog and would love some feedback. Have you thought of painting the cabinet in picture #1 and couch covers I too couldn't believe how much they cost to purchase any. I can't believe I just heard about your party and I am to late to link up!! I just did a post yesterday asking for help and idea's for redoing my family room! Sorry I didn't make it on Wednesday, I was doing a Crafty Feature! There's so much potential in your living room! I would go with a Minimal Country look, this way your couch and chair are still perfect in the space. Declutter, and put the cute wreath somewhere else in the house. I would paint those picture frames black, and get new sheer, white curtain panels. Simple and clean, they just hang to the floor. I can't decide about the lamps. This look is still country and your couch will look fab, but it's clean, minimal, and fresh looking. That's my 2 cents. OK, I'm late, but here's what I see. 1. I like the darker frames, but I would do them black or a steel grey. I think white would wash out w/ the banjo. 2. Can the banjo hang upright or at an angle? I think a monogram another instrument would compliment it nicely. I'm not a fan of indoor wreaths. 3. Slipcovers are just some fancy tucking, you can acheive the look by using a king size sheet or sewing 2 or 3 pieces of fabric together straight. 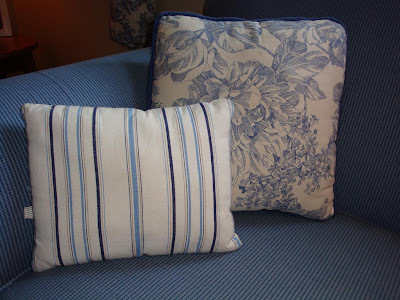 :) I would cover the pillows, but would do more pattern rather than simple. Florals w/ blues, yellows, and reds? 4. Paint the lamps white.